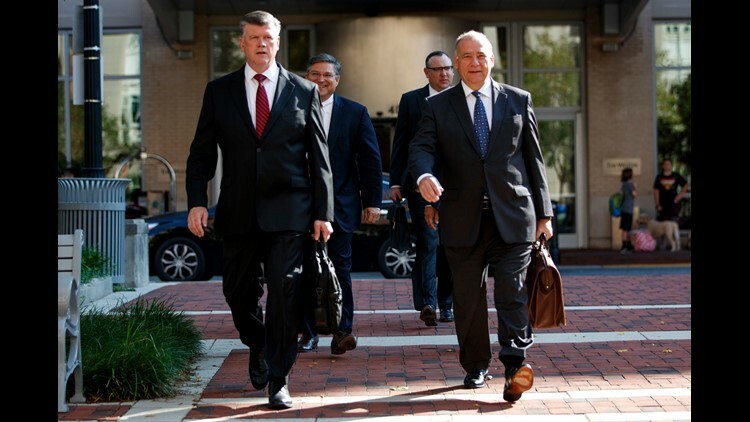 The defense team for Paul Manafort, including Kevin Downing left and Thomas Zehnle, arrive at the Albert V. Bryan United States Courthouse for the trial of former Trump campaign chairman, Friday in Alexandria, Va.
ALEXANDRIA, Va. – The chief executive of a Chicago bank “expedited” approval of $16 million in loans for Paul Manafort after the former Trump campaign chief discussed a possible role for the executive in the campaign and ultimately in President Donald Trump’s administration. Within days after the first of two loans closed – following Trump’s November 2016 election – Raico told a federal court jury that his boss asked him to call Manafort to learn whether Calk was still in the running for cabinet positions to lead the departments of Treasury or Housing and Urban Development. Raico, who was testifying Friday under a grant of immunity from prosecution, said that Manafort’s loans were approved even as questions were raised about his financial condition. More questions swirled around an American Express card debt of more than $210,000 for 2016 New York Yankees season tickets. Raico said that Manafort had explained that an associate had borrowed his credit card to make the purchase and would settle the debt. That associate, business partner Rick Gates, testified earlier that Manafort had asked him to write a letter affirming the account even though Gates said he had no role in the purchase. Later Friday, Irfin Kirimca, the Yankees' director of ticket operations, testified that the Major League Baseball team dealt only with Manafort on the ticket purchase. He confirmed correspondence between the team and the defendant, who in an email told Yankees' officials that he and his wife, Kathleen Manafort, would be attending the game on Opening Day. Prosecutors also produced a signed agreement between the baseball franchise and Manafort, which provided ticket-holders access to iconic Yankee Stadium's premium seats in the Legends Suite. Defense attorneys, meanwhile, sought to downplay the bank officer's testimony, asserting that Manafort offered appropriate levels of collateral to secure the $16 million in loans from Federal Savings Bank. Raico acknowledged that the real estate and cash Manafort offered to secure both the $9.5 million refinance loan and the $6.5 construction loan were within the bank's guidelines. Raico also conceded under cross examination that he had no "concrete" knowledge that his boss, Calk, was seeking anything from Manafort in exchange for the loan approvals. The testimony came as prosecutors are seeking to wrap up their tax and bank fraud case against Trump’s former top campaign aide. While the case does not involve matters related to Russia's interference in the 2016 election, it is the first criminal trial brought by Justice Department special counsel Robert Mueller who is heading the Russia inquiry. U.S. District Judge T.S. Ellis III has limited references to Manafort's relationship with Trump, but Friday's testimony offered the most substantial information yet to the jury about Manafort's association with Trump. He joined the campaign in March 2016 and left five months later. The case was abruptly delayed Friday morning when the judge put the trial on hold, offering an unusually emphatic instruction to the jurors that they should not discuss the case with others or among themselves until all the evidence was in. Ellis, who did not explain the reason for the delay, also reminded the panel that Manafort, who was seated at the defense table, is presumed innocent of the 18 criminal counts lodged against him. Prosecutors had expected to conclude their case Friday, but the delay pushed the government's final witnesses to Monday. Ellis said the case could move to final arguments as early as Tuesday, depending on whether Manafort's attorneys elect to offer their own slate of witnesses.